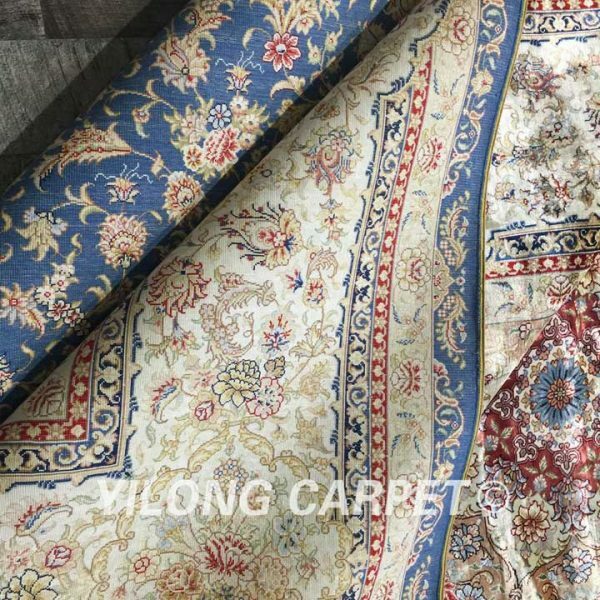 This hand-made silk rug is a unique design in the world, with vivid color and exquisite weaving, has won the favor of popularity of consumers. 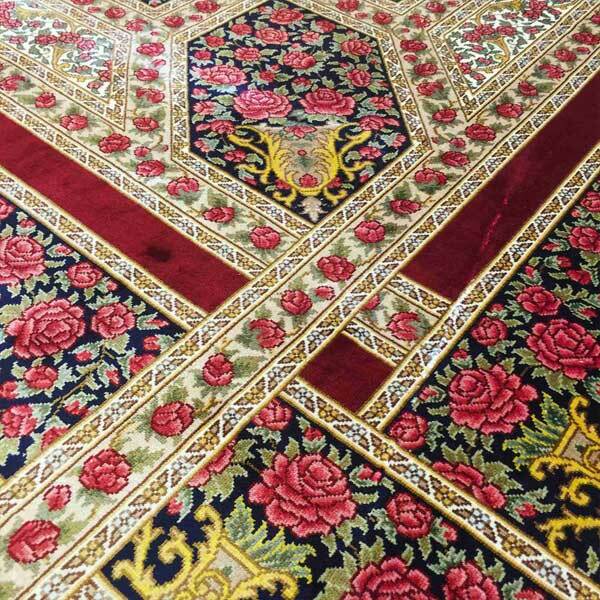 The whole carpet is designed with rose, a few aureate vases. The red rose match with wine red background color, full of vitality and the yearning for a better life. 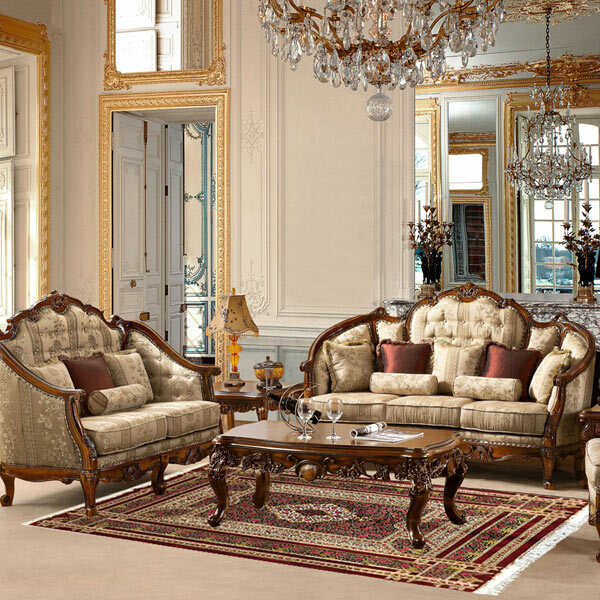 It is not only a work of art, but also can add luster to your home; luxury, elegance shows it all. 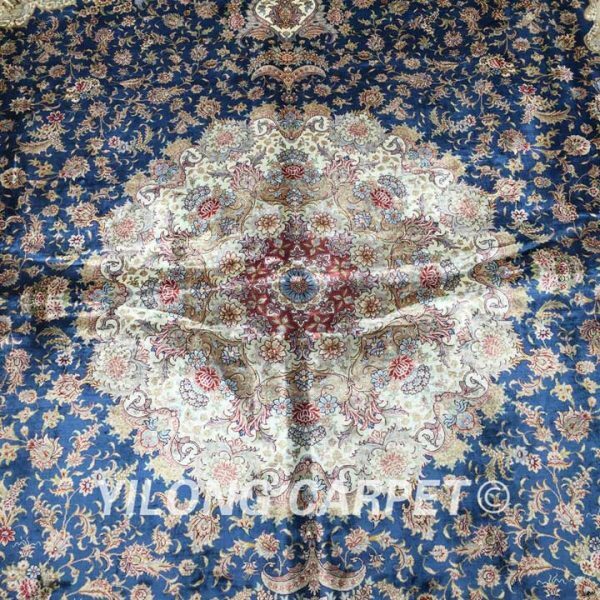 You have seen a lot of exquisite workmanship and fine pattern handmade silk carpet. 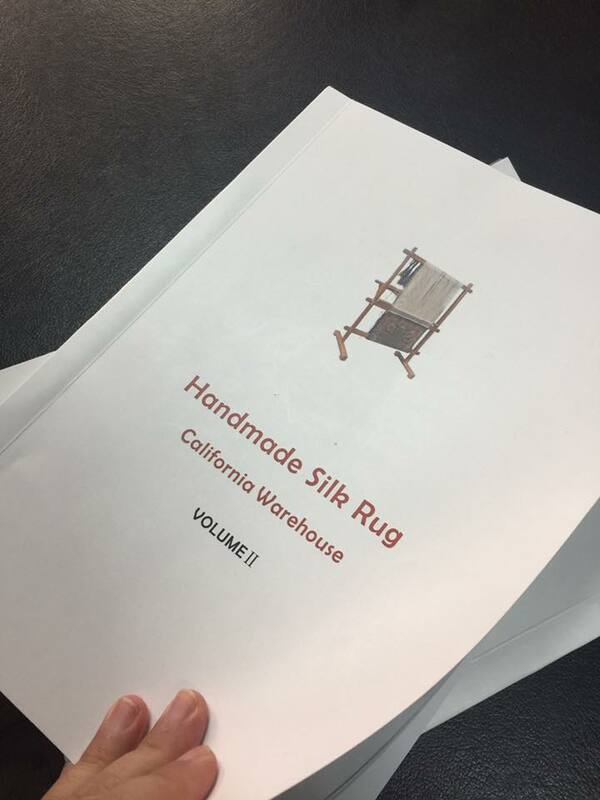 Do you know where are they been woven? And who weave them? 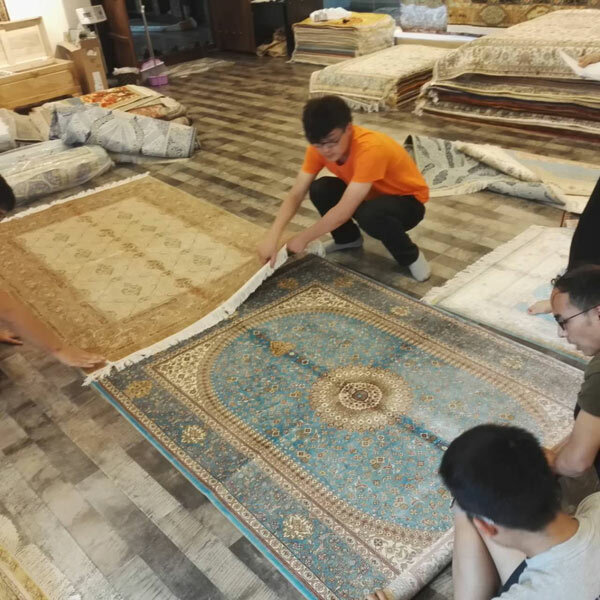 Each of handmade silk carpets is made in the farmers’ house of mountain area. Mountainous terrain is rugged, traffic is not suitable for popularization, the infrastructure construction is difficult, and the economic foundation is relatively backward. The people there depend on farming for a living, but they only have a little food to feed themselves, some of their children even can't afford to go to school. Weaving handmade rugs can give them some income to improve their lives. During the harvest season, they harvest their crops. 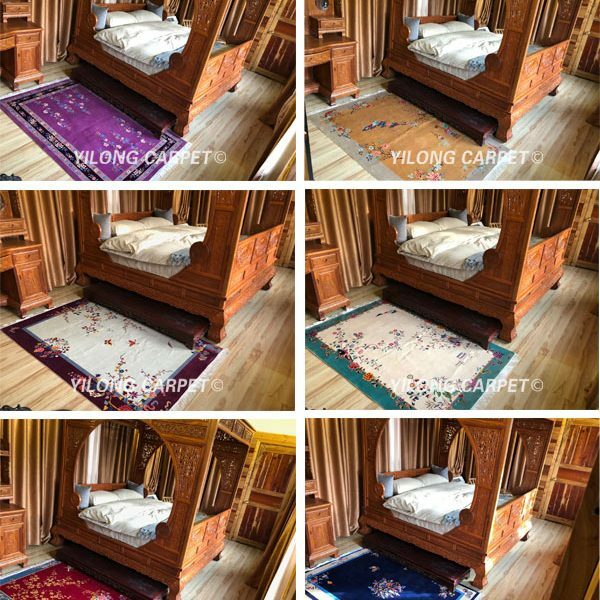 At the other time, they sit in front of the loom to weave carpet. 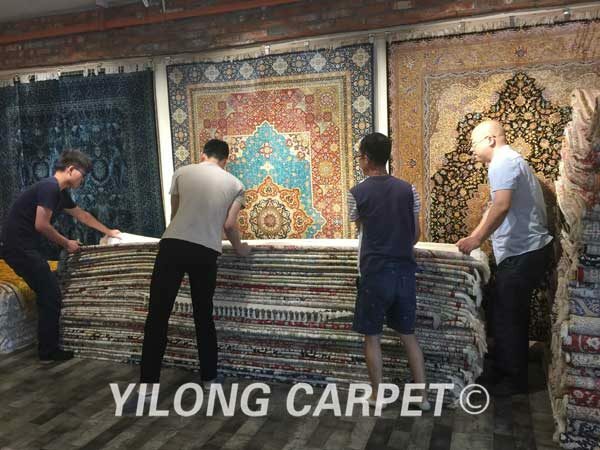 They weave carpet at least 10 hours a day. 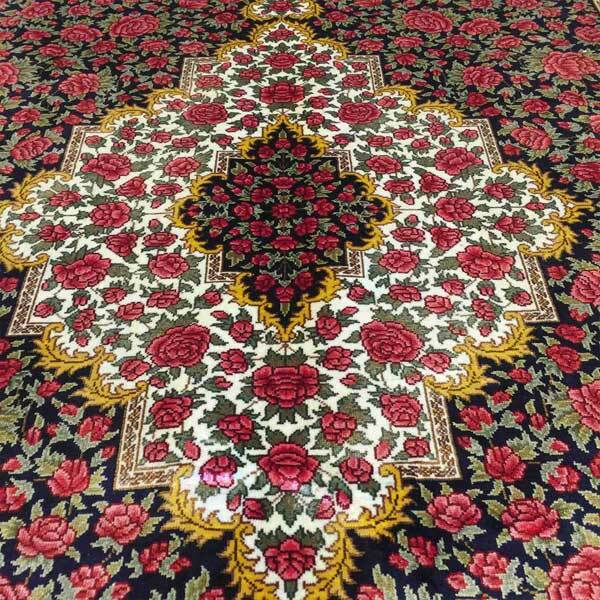 Regarding the 30-50 years old weavers, they can weave around 6 square feet carpet per month. 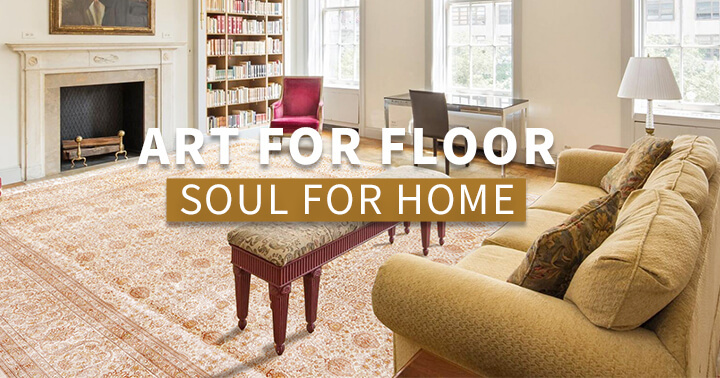 For the 50-60 years old weavers, they can weave around 4 square feet carpet per month. 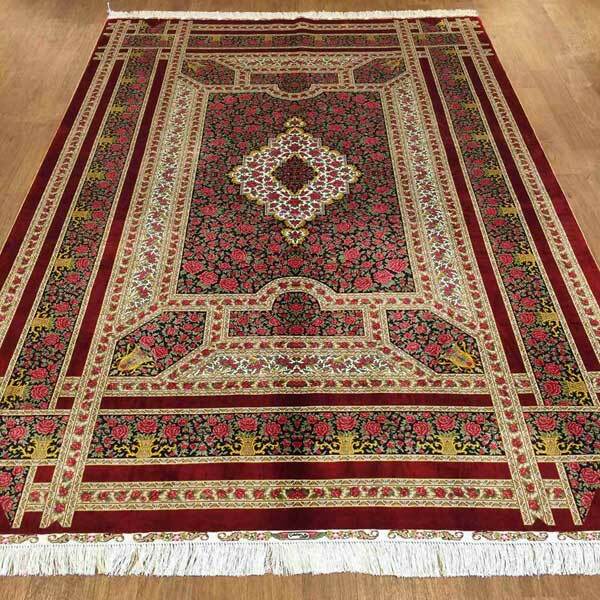 Each of handmade carpet coagulates the painstaking effort of each weaver. 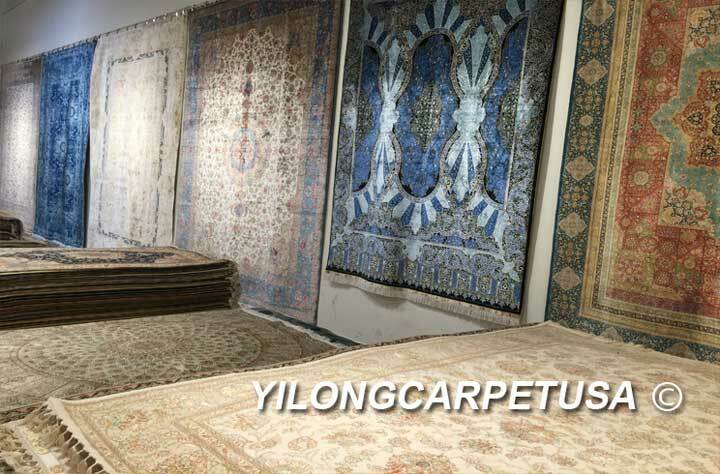 Each carpet has a record that to be woven by which weaver. 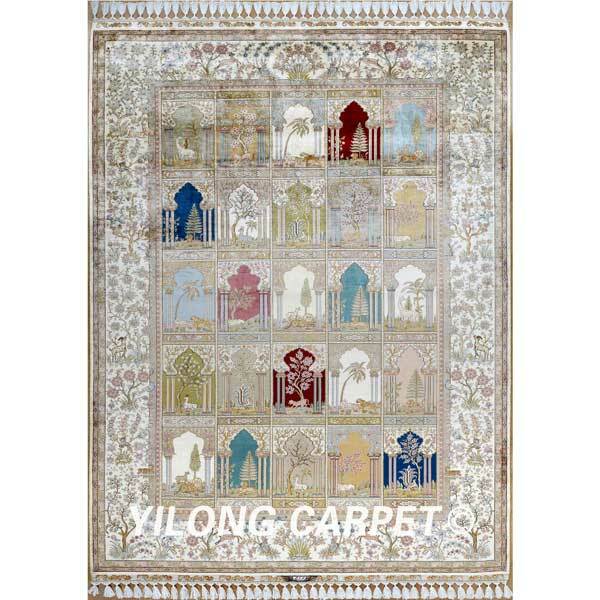 Each carpet you buy will improve the weavers' life, and can make their children get education. 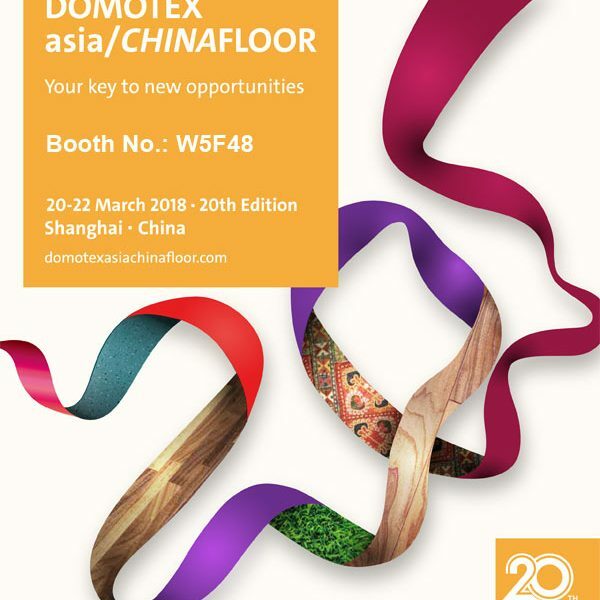 The Domotex Asia/CHINAFLOOR exhibition which will be held in Shanghai from March 20th to 22th. Welcome to visit our booth. Our booth number is W5F48. Good News! 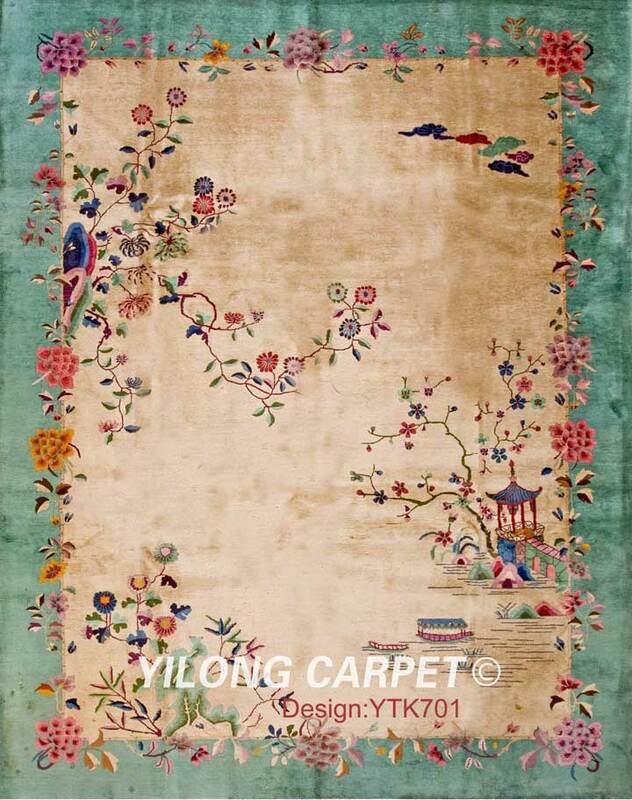 Some new design of Chinese art deco handmade silk rugs which produced by Yilong Carpet Factory have been launched today. The launched time was a month earlier than expected. The quality and color combination are very nice. 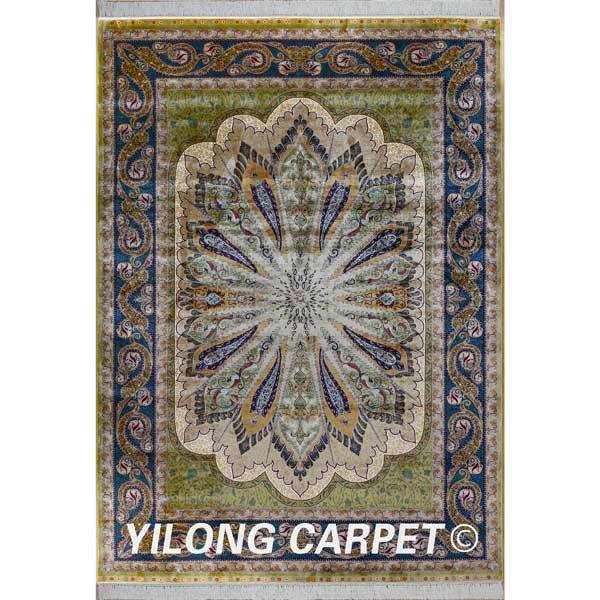 We also can produce according to consumers’ favorite design and color. 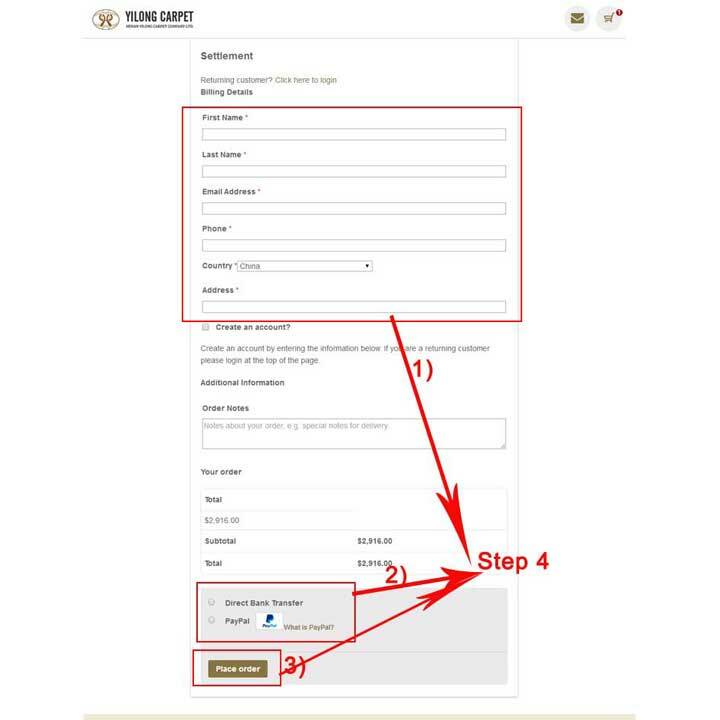 Why to launch at February 16th? Because that February 16th is the first day of Chinese Lunar New Year 2018. This means a good starting. 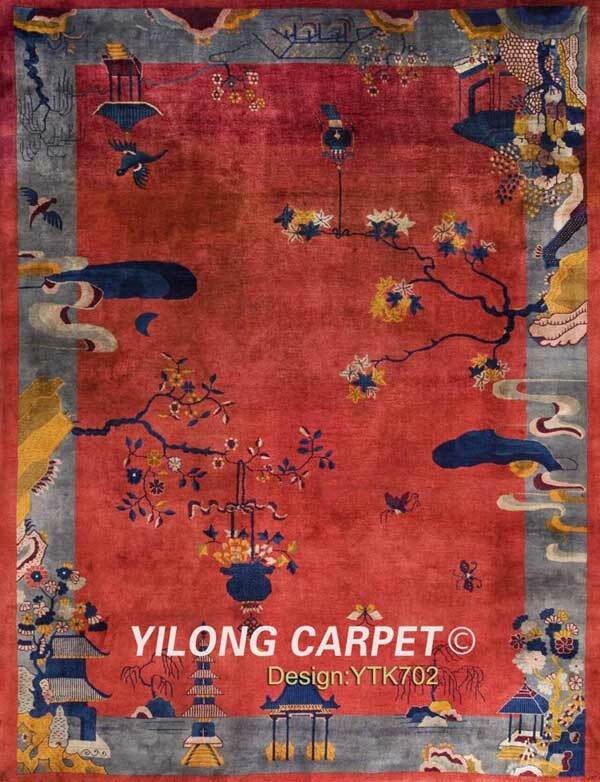 Hope the Chinese art deco silk rugs will be popular in the market. 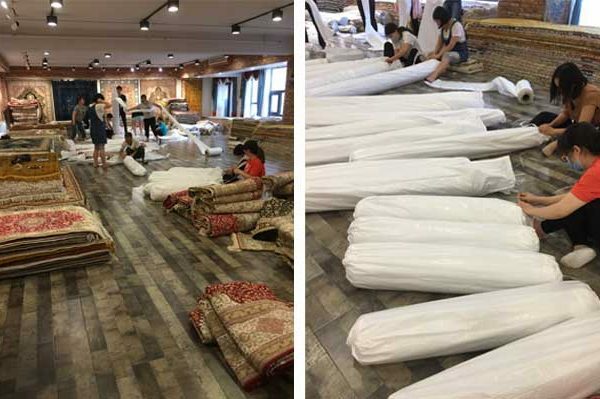 At the beginning of year 2018, the first shipment of silk carpet around 10000 square feet have been sent to our customer. 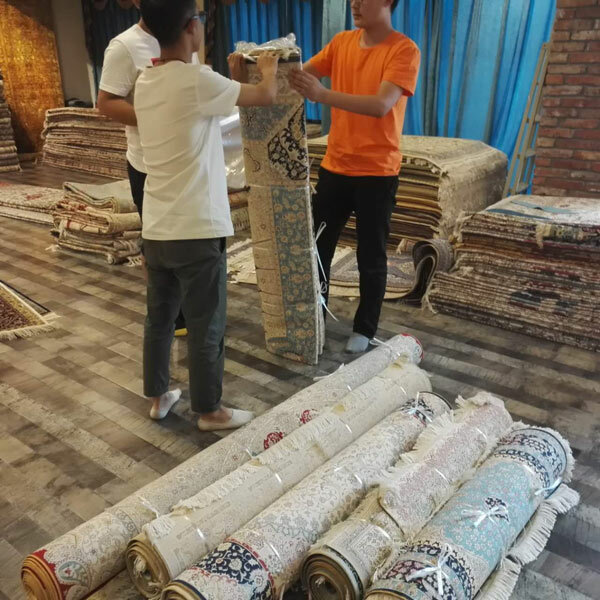 With the improvement of Chinese consumption level and consumers' aesthetic appreciation, there are many Chinese families starting to use the handmade carpet. 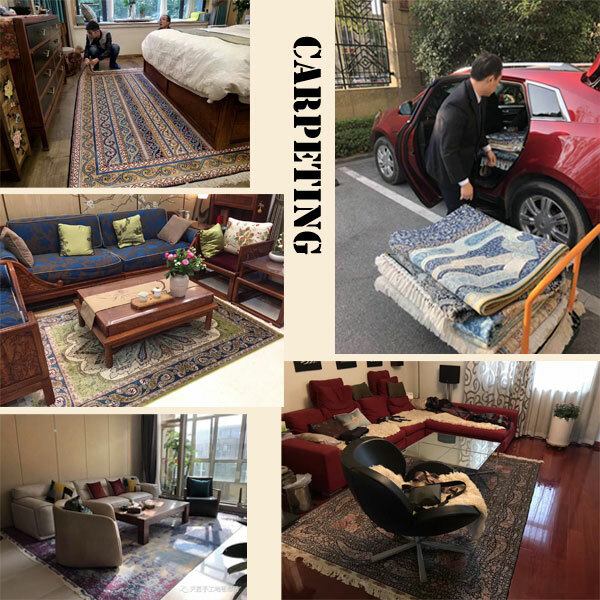 In order to let more families in China to spread the handmade carpet, we set up an on-site free trial carpeting service team. 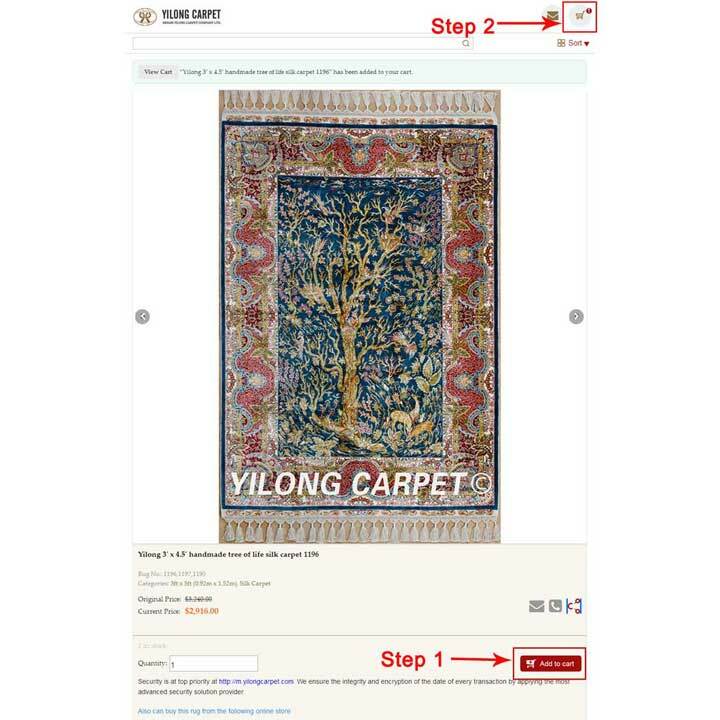 That means that if you need handmade carpet, please tell us the size and color you want, or you select some carpets from our e-catalog, we will take these carpets to go to your house for free trial carpeting. No matter your house in China mainland, Hong Kong or Taiwan. 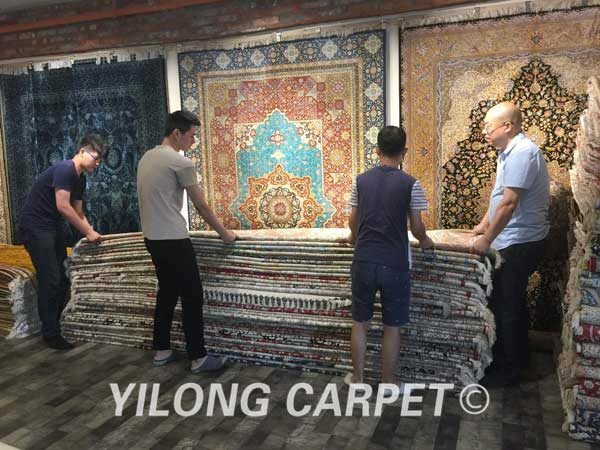 Yilong Carpet was honored to be interviewed by Sixth Tone. Sixth Tone is a famous media company in China. 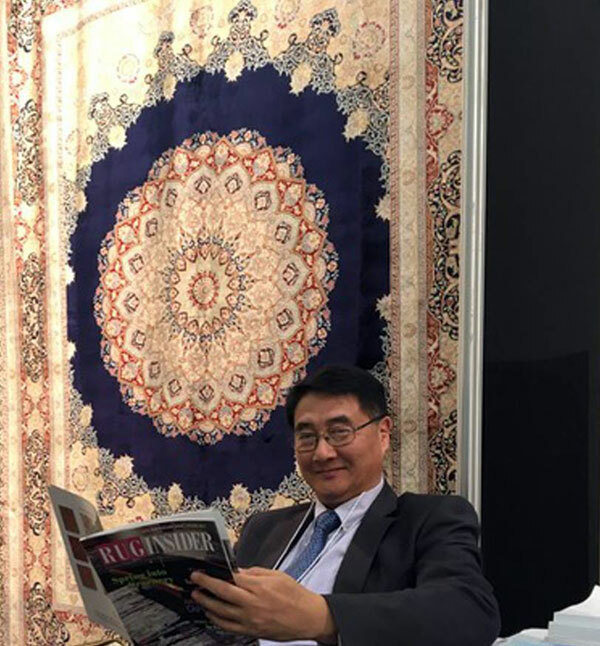 Mr. Han - the owner of Yilong factory says that our annual production was about one million sq ft on handmade silk rug itself. 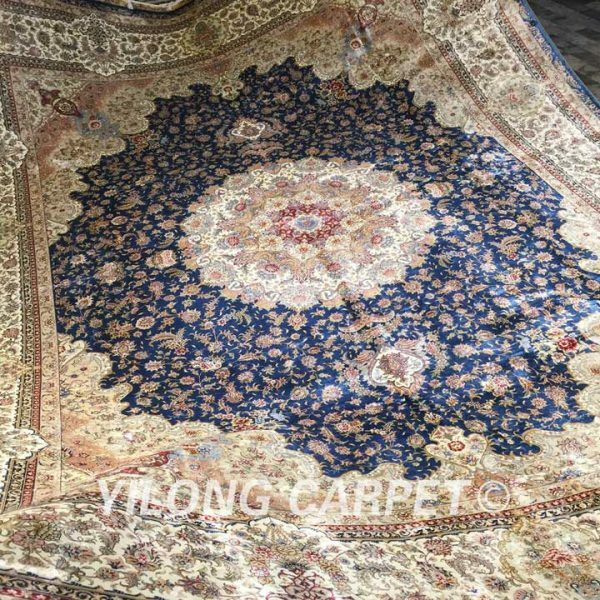 YILONG has 500,000 sq ft handmade silk carpet inventories. 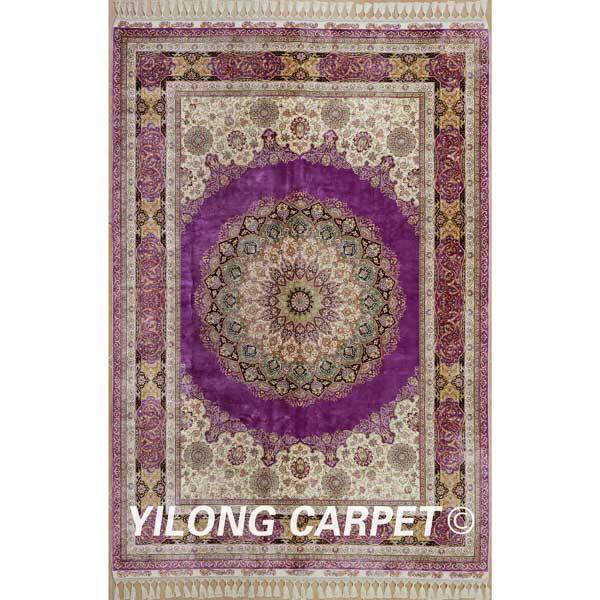 The world handmade silk rugs go through the change from the traditional design to new design. 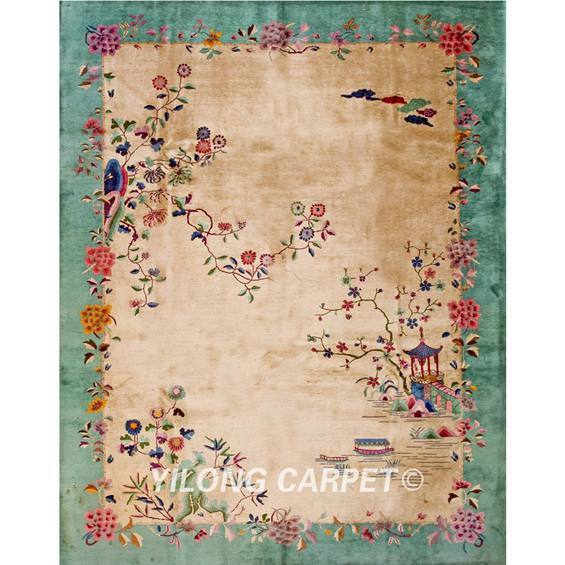 But have to admit that the traditional design silk carpet is still enjoyed by the wide consumers. 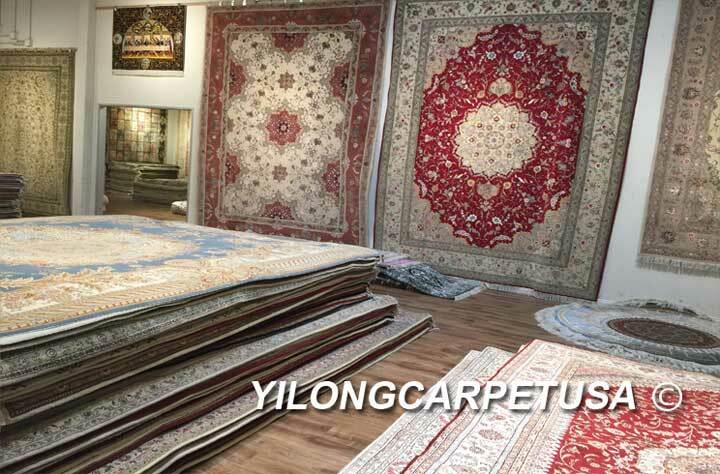 Today, 21 bales handmade silk carpet and wool carpet sent to Middle East. 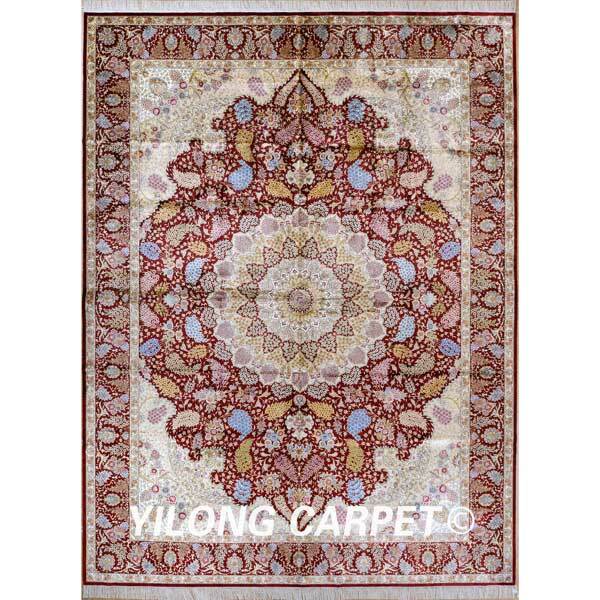 Our factory makes one million square foot handmade silk carpets per year. 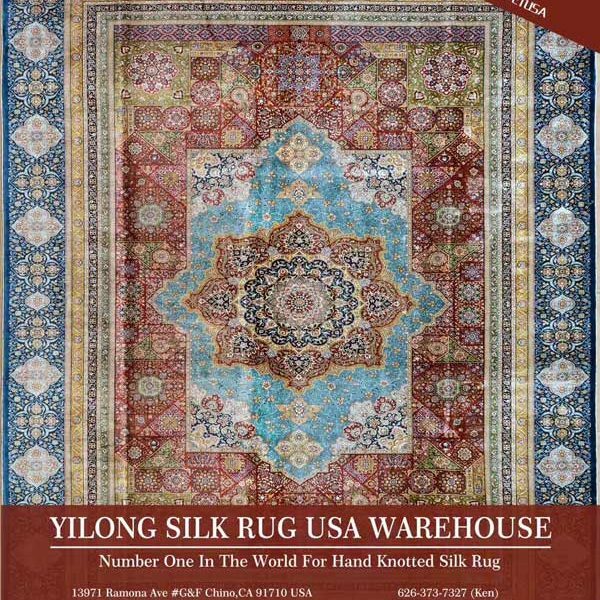 We have 500,000 sq.ft inventories in our Aisa and USA warehouse. 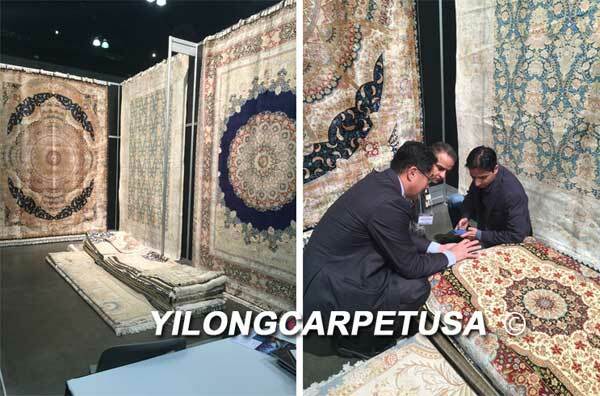 The Rug Show at -New York - Biggest Rug and Carpet only Expo In USA. 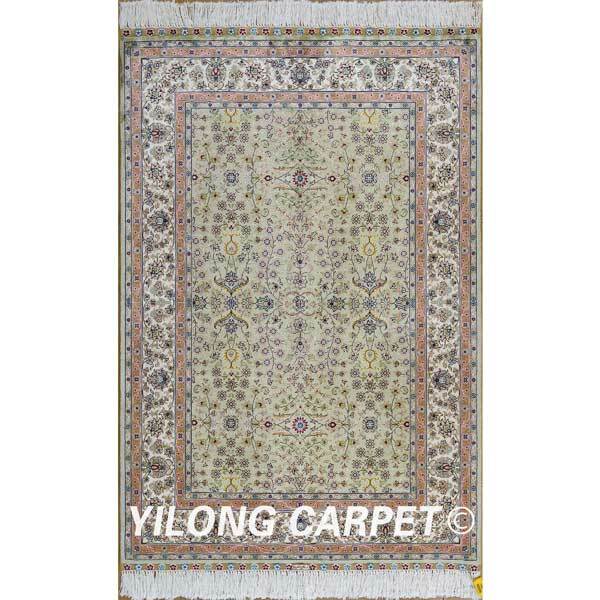 Yilong Carpet-- biggest handmade silk rug manufacture and stocking biggest inventory of silk rug in the world. 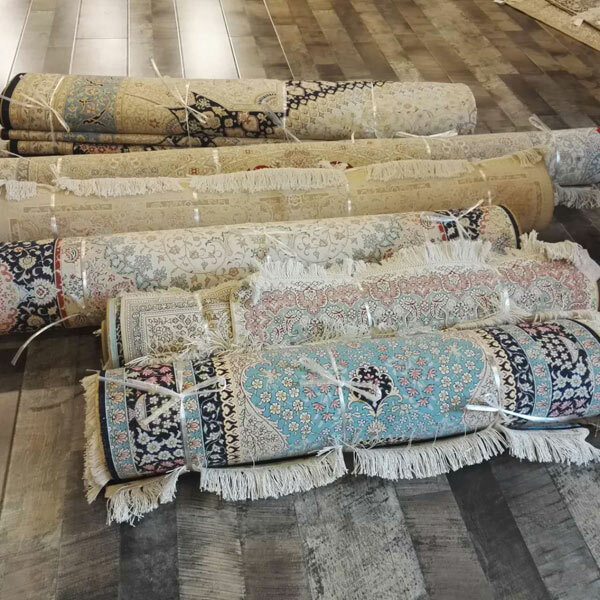 Today, 6 bales hand knotted silk carpets have been packed carefully and sent to France by air. 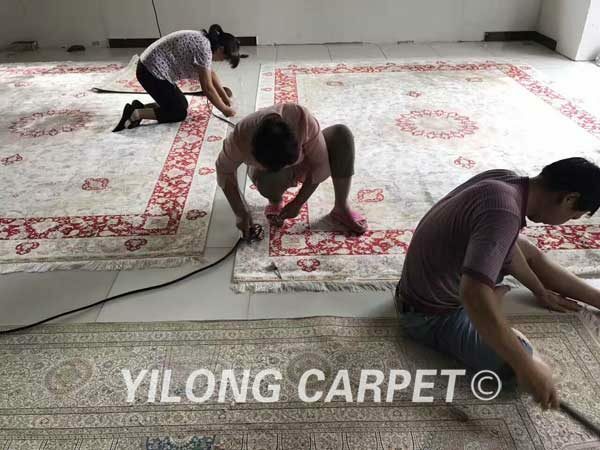 The busy worker in Yilong’s factory. 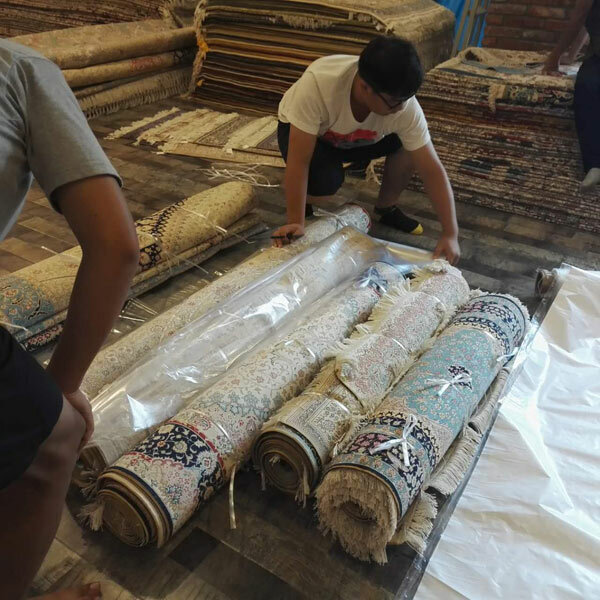 37 bales, 128pcs, 3989.4sqft customized silk rugs order is ready after 8 months. We packed them today and delivered them to our middle-east customer on time. 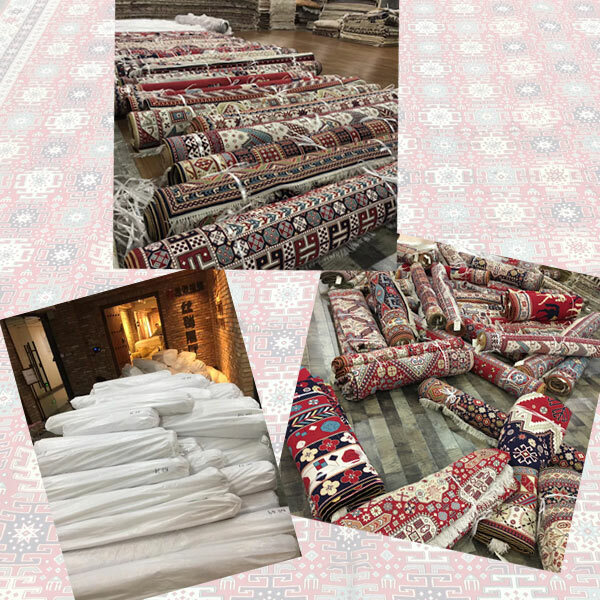 This week, two 2.8’x20’ silk runners are just down from the loom. For these two silk runners, they took our two weavers 18 months to complete them. 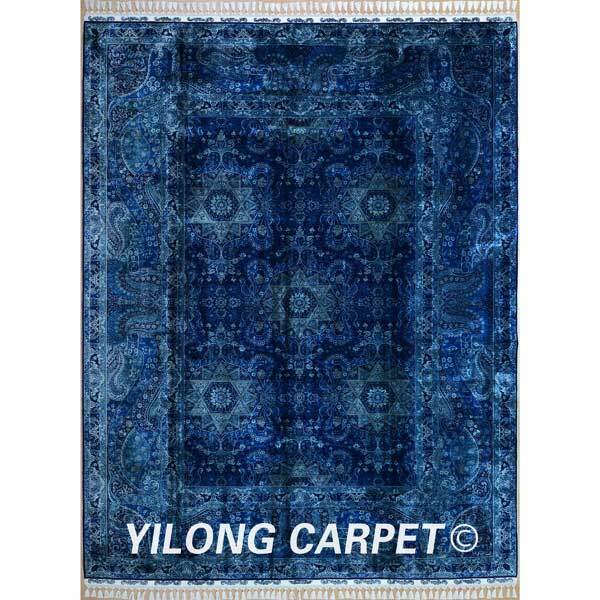 YILONG owns six producing bases in Asia. 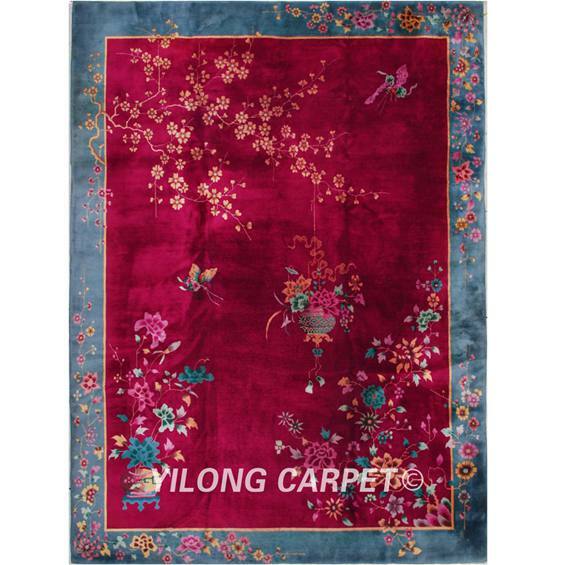 There are many experts visit YILONG to study and research the developing of silk carpet hand knotting. 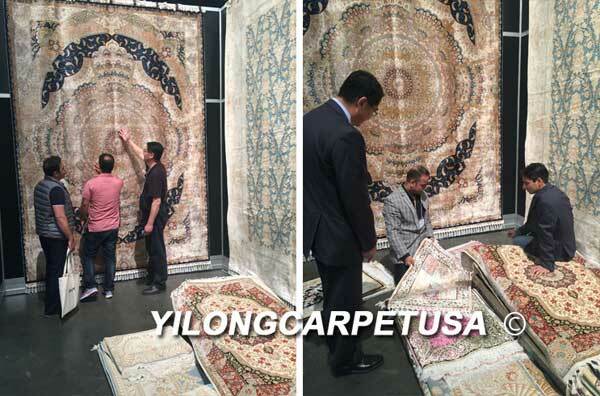 Please enjoy the silk carpet show which has been paved in our USA customer's villa. 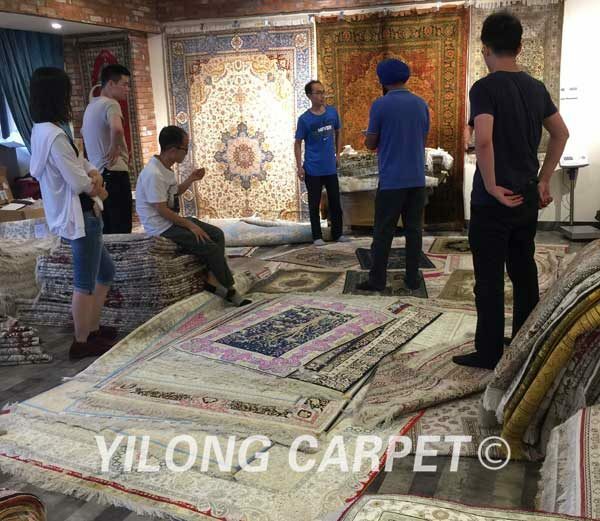 Handmade silk rug "China Story" series designer meeting was held in YILONG today. The first two designs will be "YTK701" and "YTK702". The size will be 6.56x9.84ft. 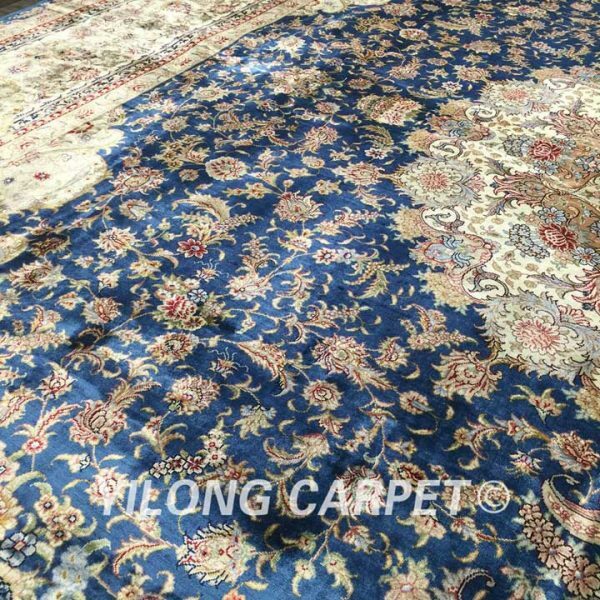 The carpet will be down from the loom in August 2017. 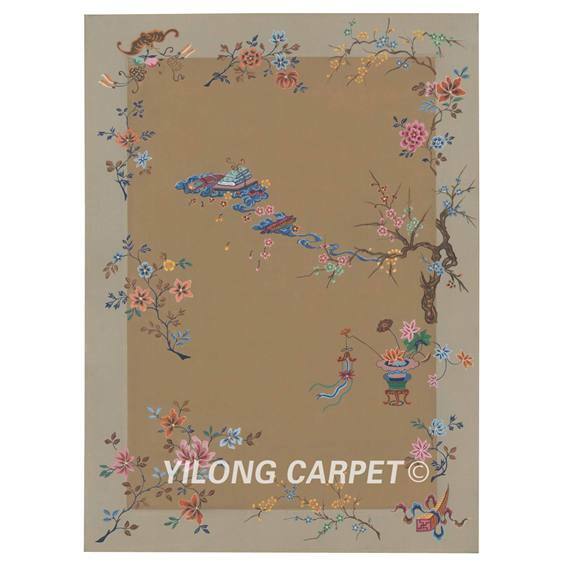 These will be the first real Chinese Style Handmade Silk Rug in the world. 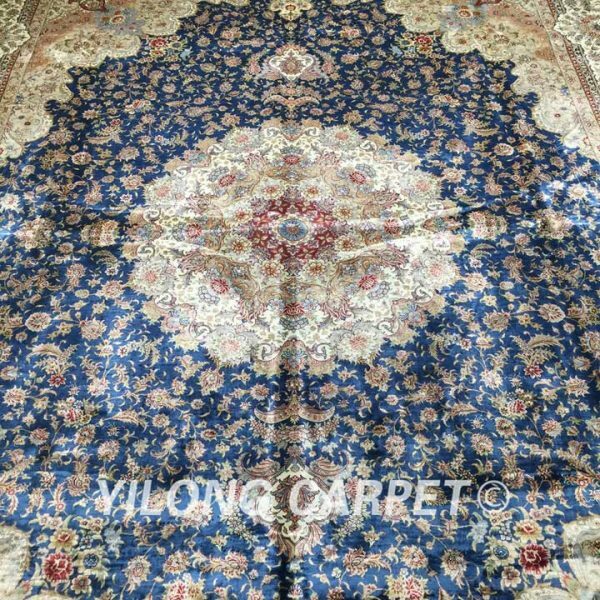 How to weave a hand knotted silk rug? 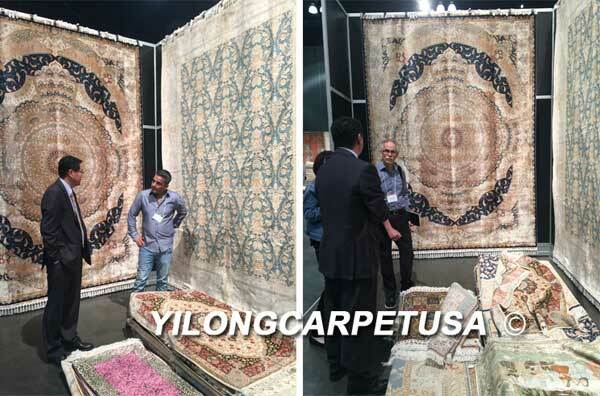 Yilong Silk Rug Warehouse USA Inc look forward to meeting you guys at the LA Rug Show – the biggest hand made “Rug and Carpet Only” Expo on the west coast of Unite States. 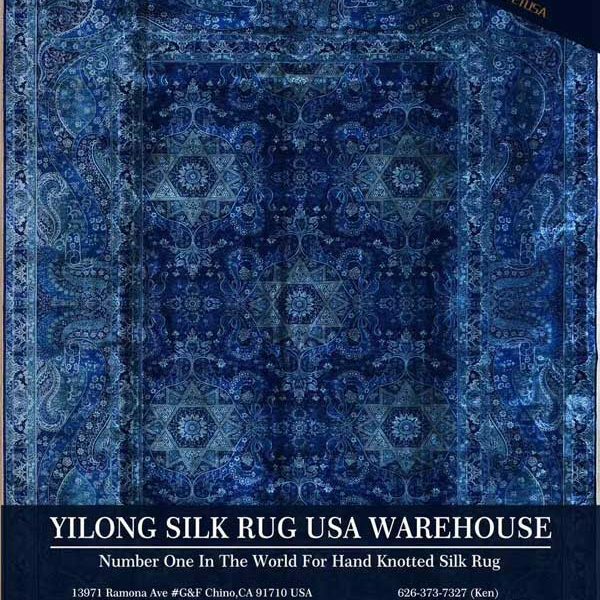 Yilong Silk Rug - Number one in the world for its oriental imports and collections. 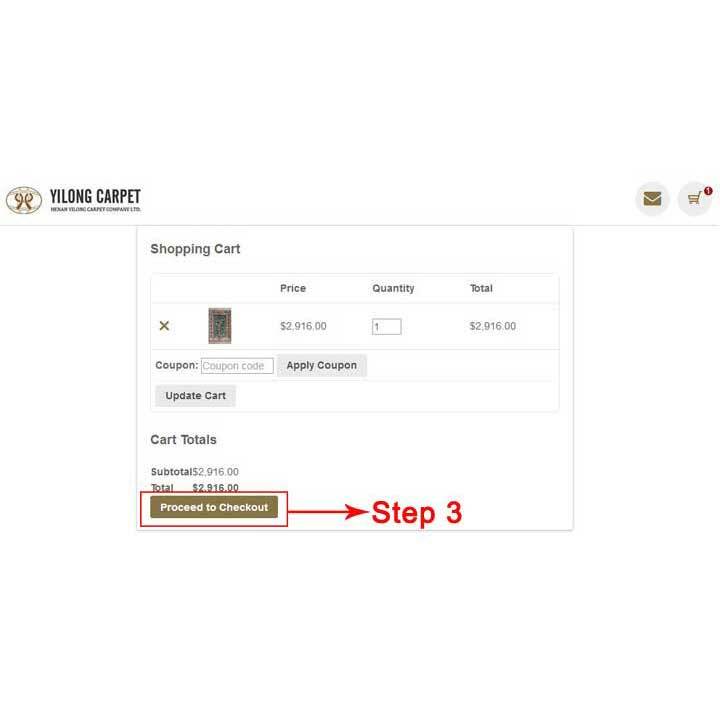 Step 3: Click "Proceed to Checkout"
2) Choose the payment method "Bank transfer" or "PayPal"
Step 5: Fill out your PayPal account and password to complete this purchase. 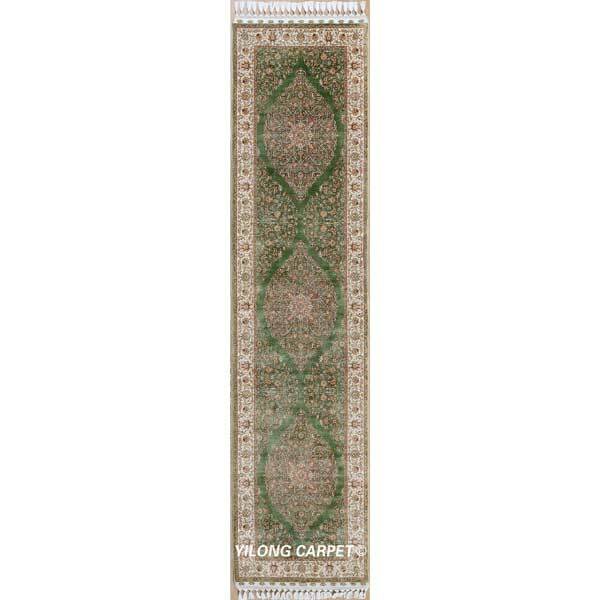 A touch of class as you approach the Yilong Carpet USA front door that locates in California USA! Upon entering you'll find that showroom area is split with two sides wall to give both areas warm and that open feeling. The other side of the showroom is the newly doubled size and newly remodeled space. 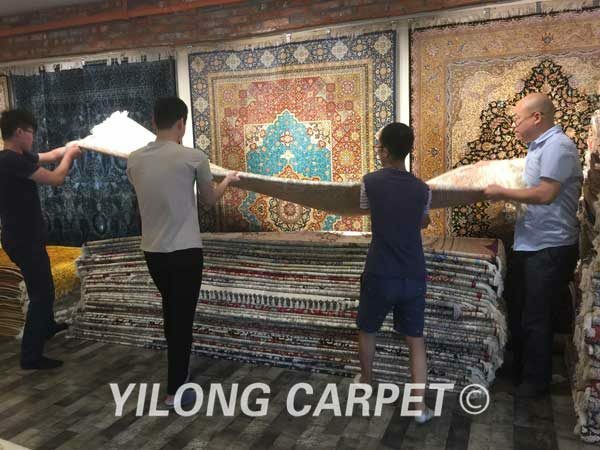 With the over 4,000 sqft showroom space, we shall be so confident and warmly providing best quality product and best service to all of our friends. 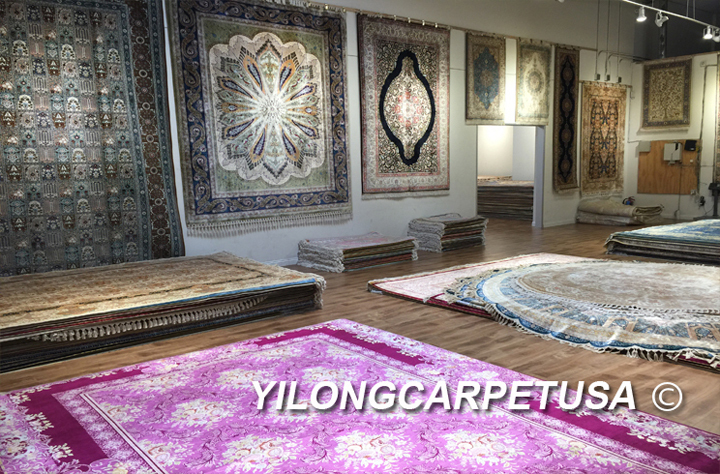 More than 2, 000 pcs or 120,000 sqft of handmade silk and wool & silk rug stock at our California facility, which fills with hundreds and thousands patterns and designs of Turkish, Persian and oriental countries rug and carpet. 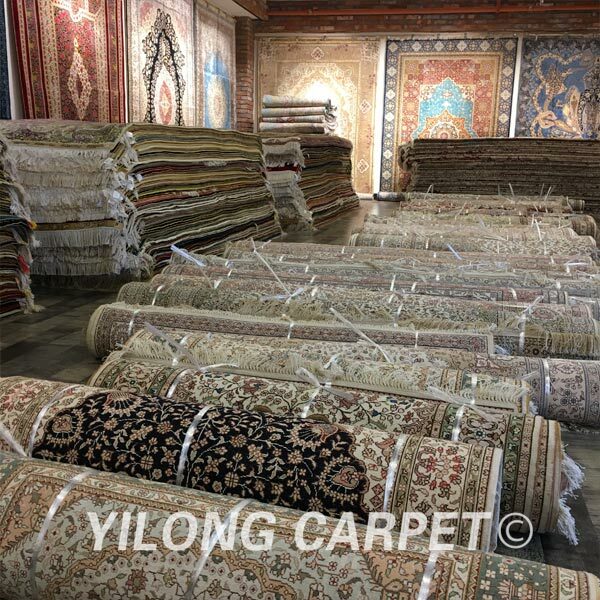 No matter what you could tell a size and design that you would like or you are looking for, we could find it at our showroom. 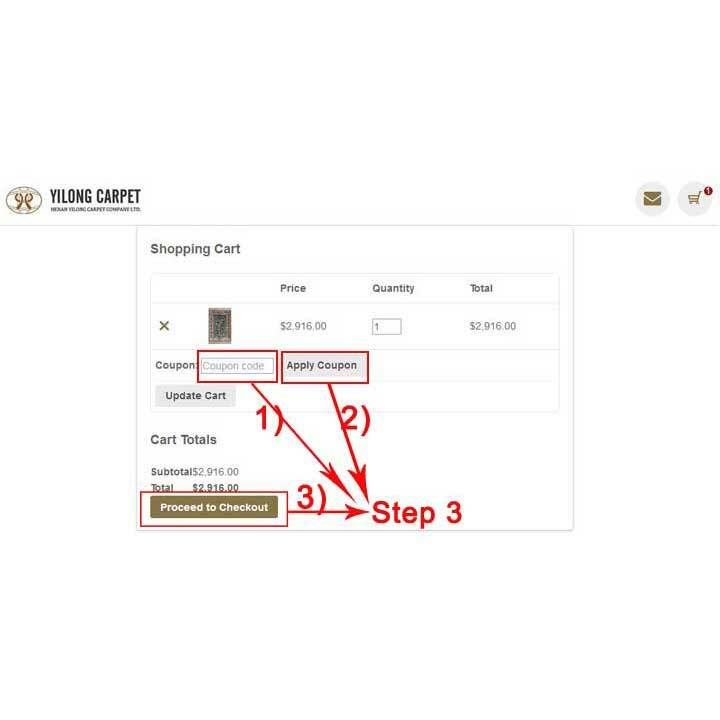 Or, we could customize the rug based on your idea and design shortly. 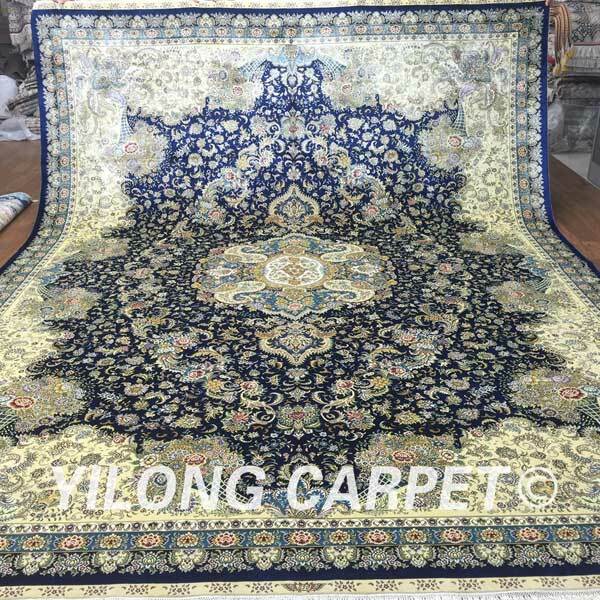 If that's not enough, what we could tell that we are biggest handmade silk rug manufacture and have the biggest inventory of silk and wool & silk rug in the world. 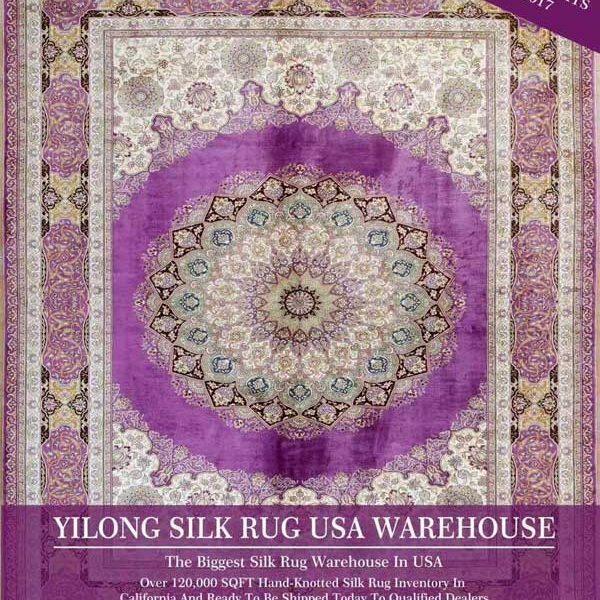 Welcome to California, Yilong USA showroom and warehouse. 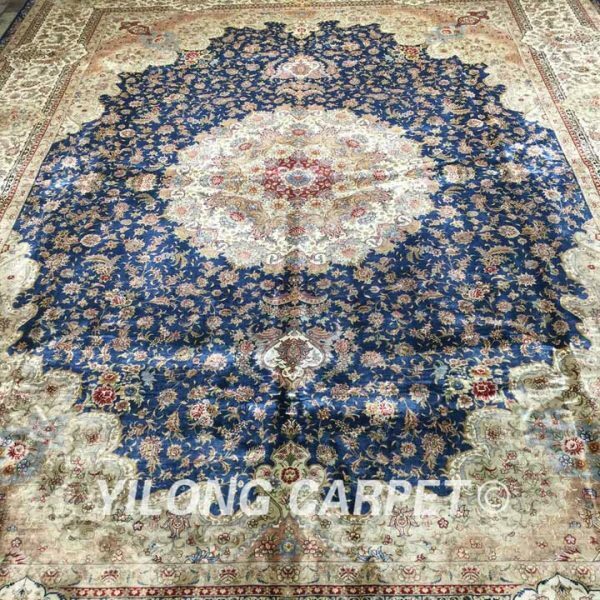 Ph/WhatsApp: 626-373-7327; Email: kenneth@yilongcarpetusa.com. 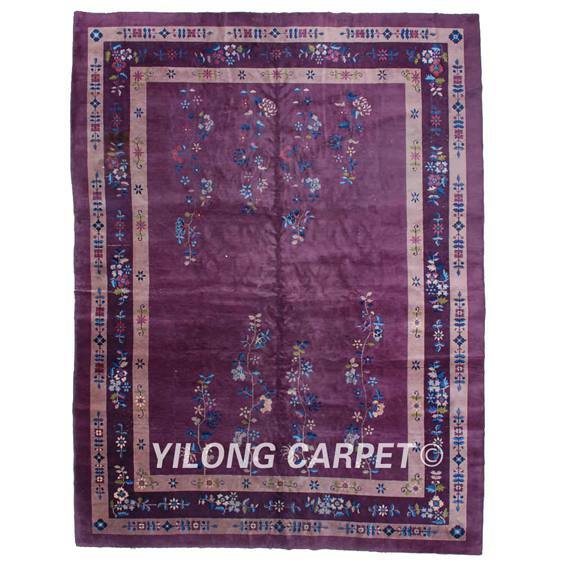 Website: www.yilongcarpetusa.com. 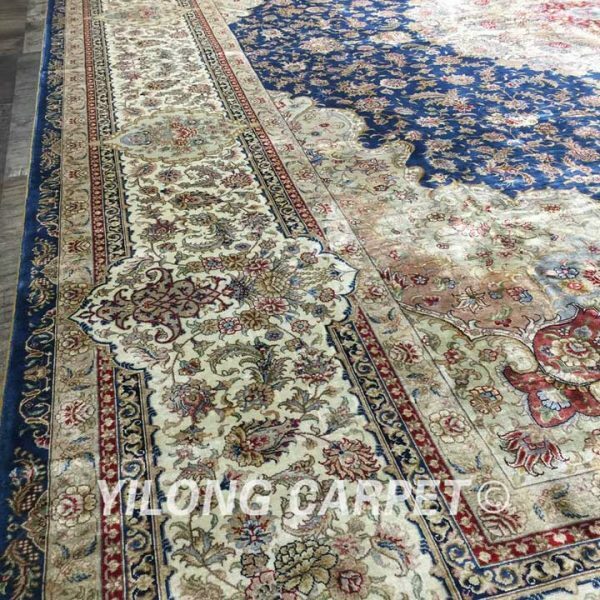 Do you know how to weave a unique handmade silk rug in Yilong Carpet factory? Please enjoy the video. 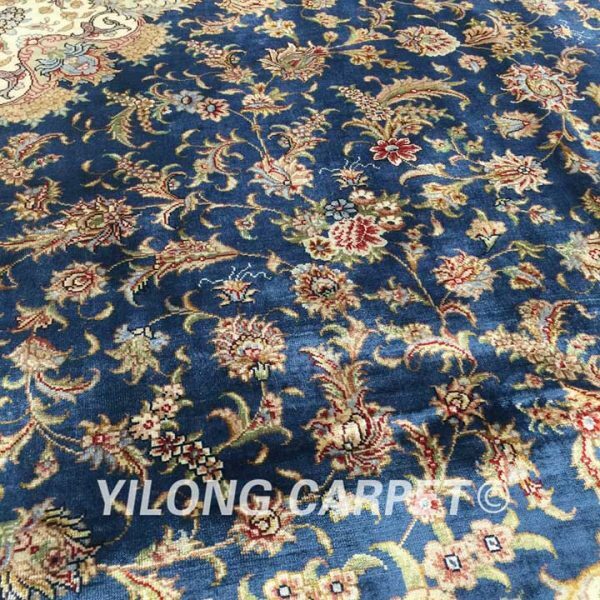 Softness is the main character of handmade silk rug, Can you imagine how soft is the carpet from Yilong Carpet factory? Please enjoy the video. 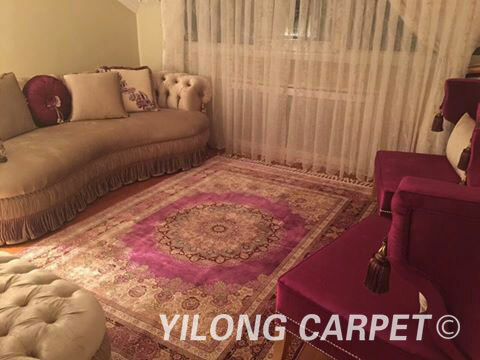 The handmade silk carpets from Yilong won the unanimous favorable comment of customer. 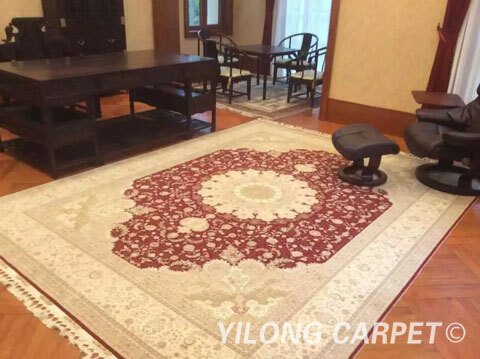 In the following, we would like to show the silk carpet which has been paved in our customer’s house. 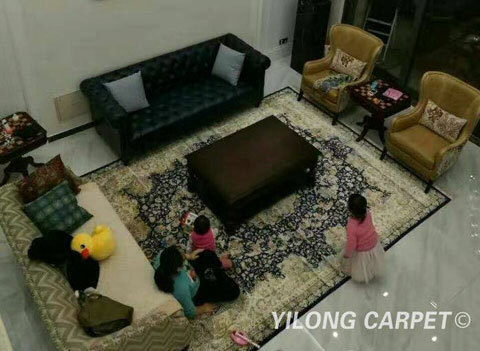 The beautiful carpets make the house looks more elegent. Pantone's color of the year is Greenery! 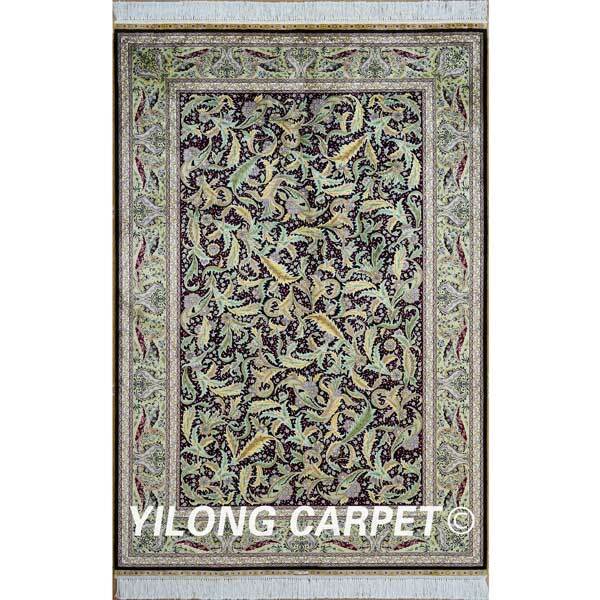 Yilong Carpet push out some silk rugs which color combined with some green color. 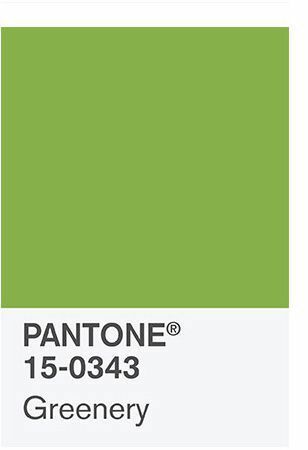 It’s no coincidence Pantone picked greenery as their color of the year for 2017. 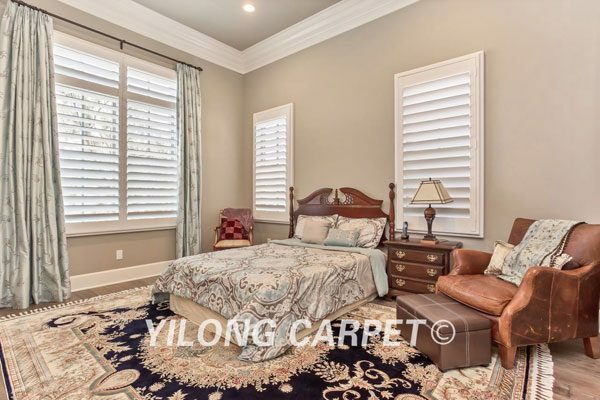 Rugs in this color will undoubtedly shine all throughout 2017 and for years to come! 4) USA, Russia and UAE are in priority . 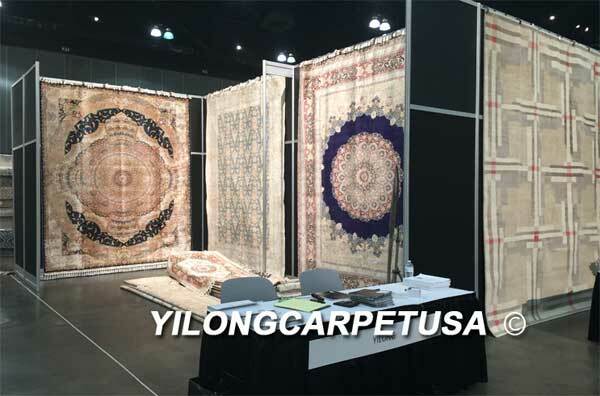 Showroom and warehouse located in California USA. 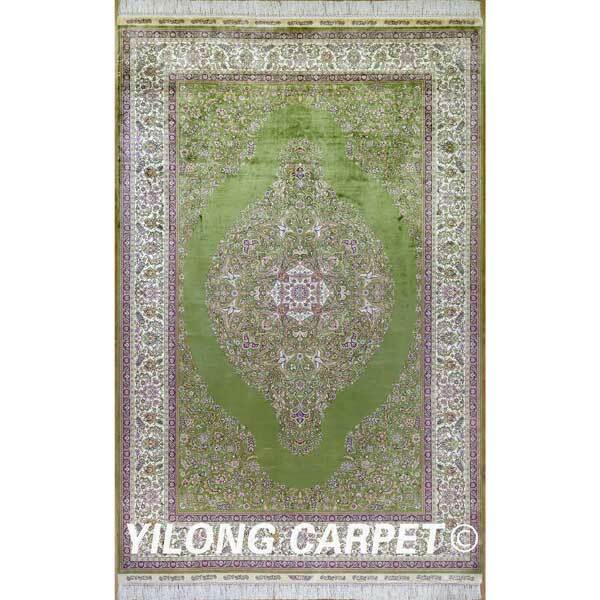 please call/whatsapp: 626-373-7327 or email: kenneth@yilongcarpetusa.com for details. 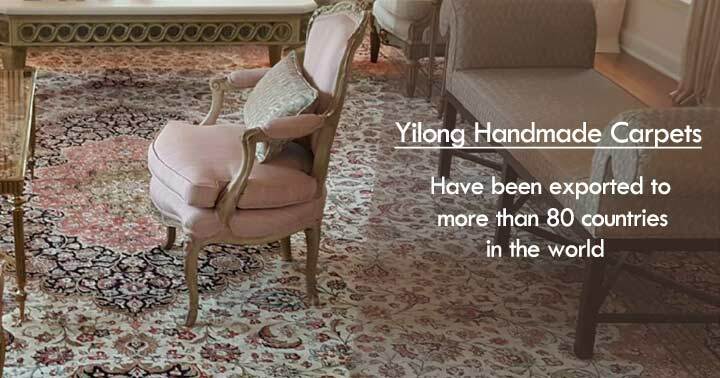 In January 1st 2017, Yilong’s 2017 new catalogue are open. 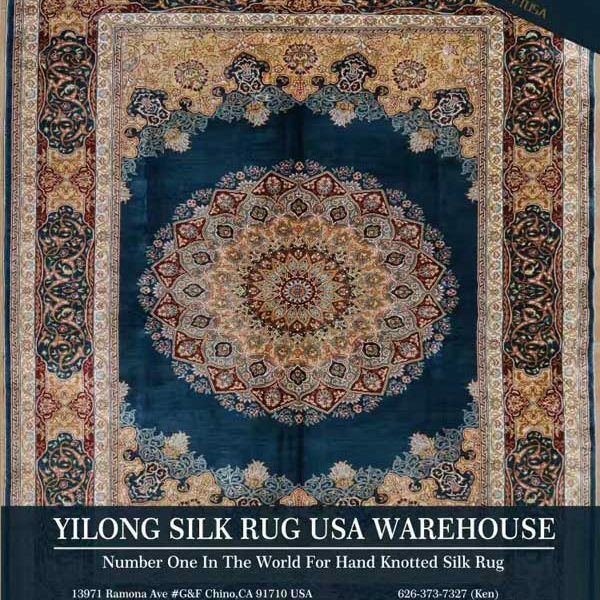 Handmade silk rugs in our California warehouse 2017 series are in following books. 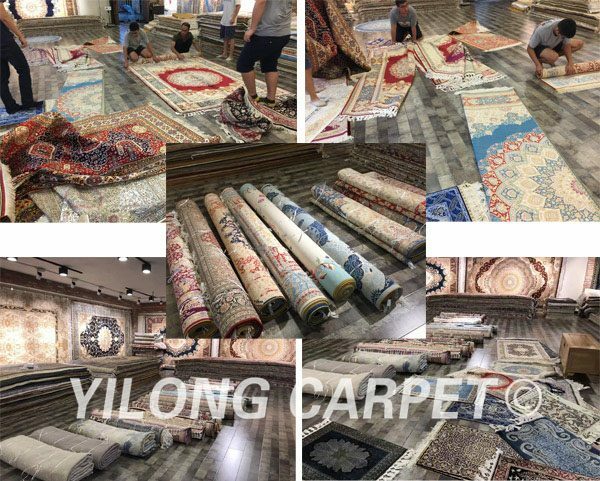 And many new designs will become to the real carpets in Yilong’s 2017 production. 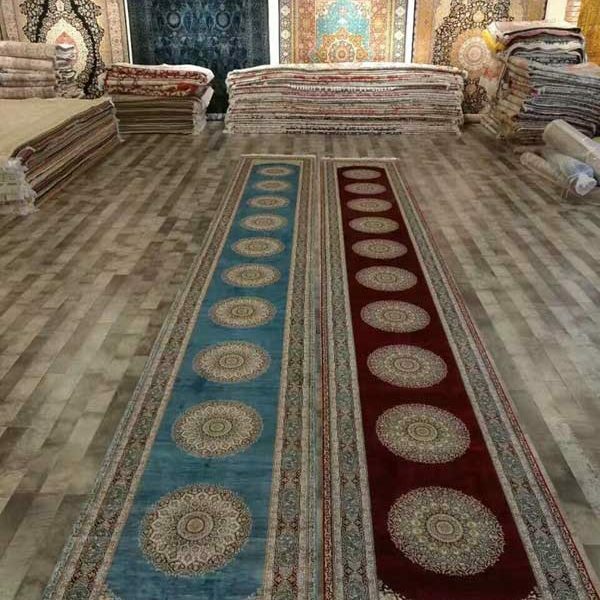 Rug retailer truck driver wanted! 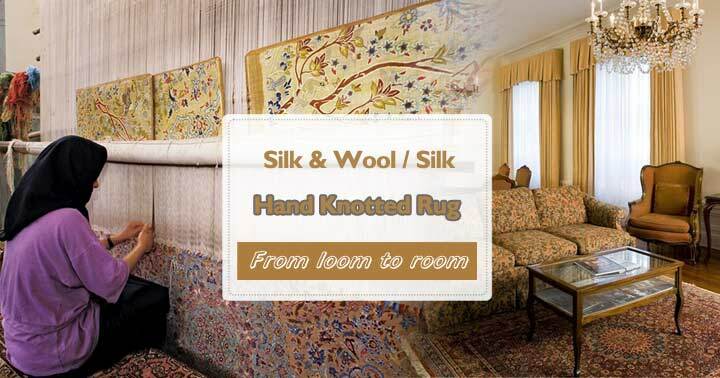 How to decorate your room with a handmade silk rug? 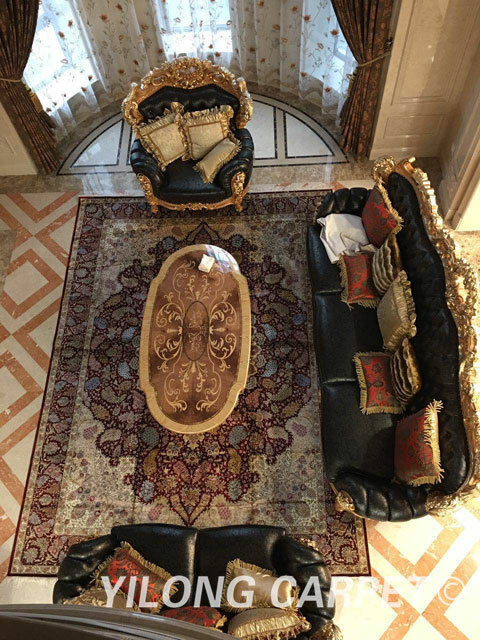 A handmade silk rug is one of the reasonable ways to make your space look like a million bucks. 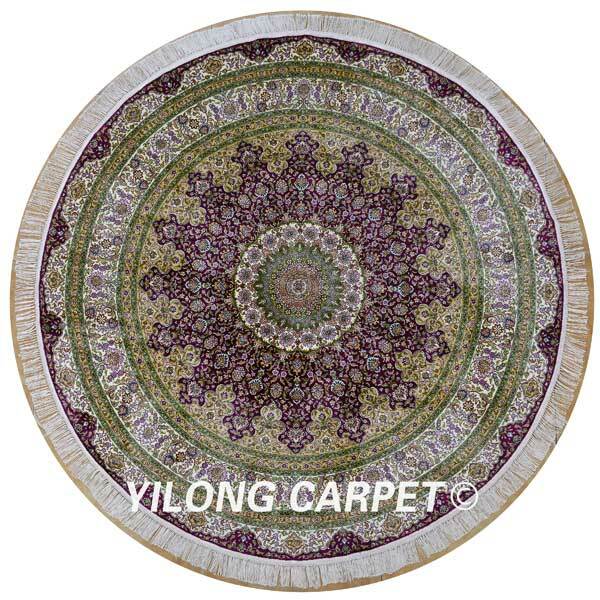 Handmade silk rug is quite easy to maintain and take care of among other floor mats. 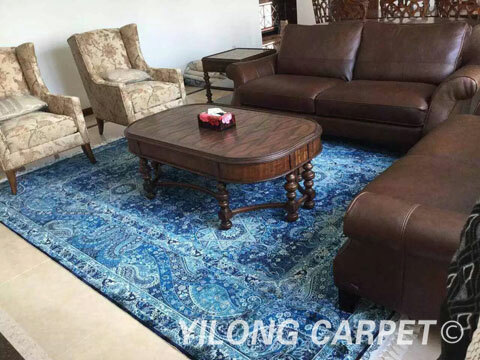 Also, these rug materials are great in terms of quality, price and eco-friendliness. 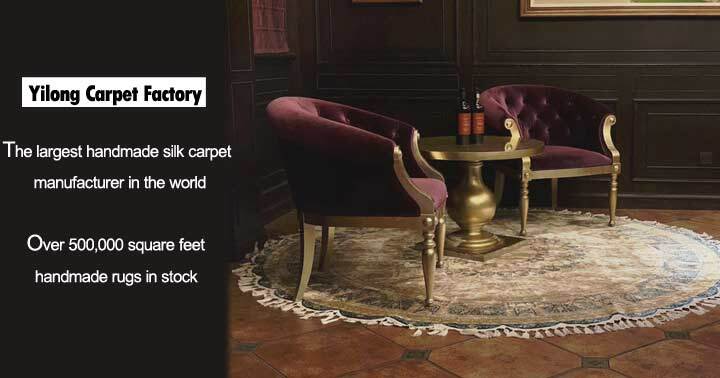 The best thing about these rugs are, they can be used anywhere in your commercial and non-commercial space for any purpose. 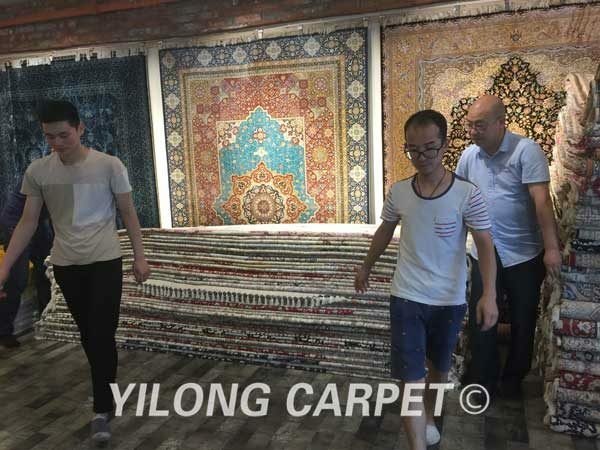 Please enjoy the rug show from Yilong in the video. 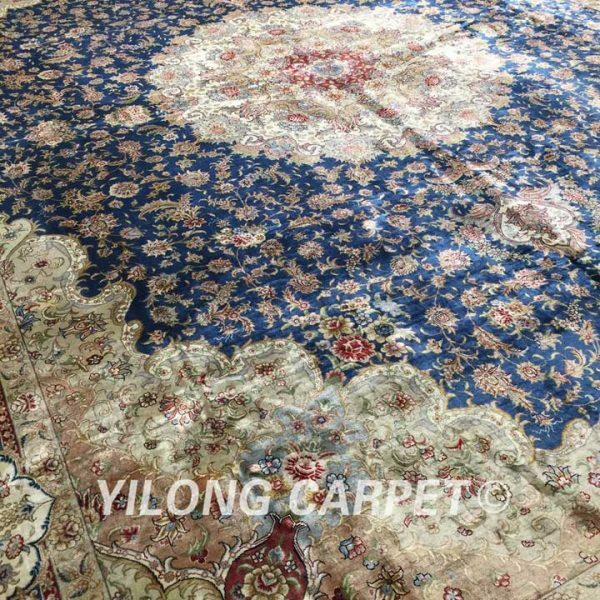 More information, please visit our website: www.yilongcarpet.com Or contact Ms. Alice, Email: alice@yilongcarpet.com, WhatsApp is 0086 15638927921. 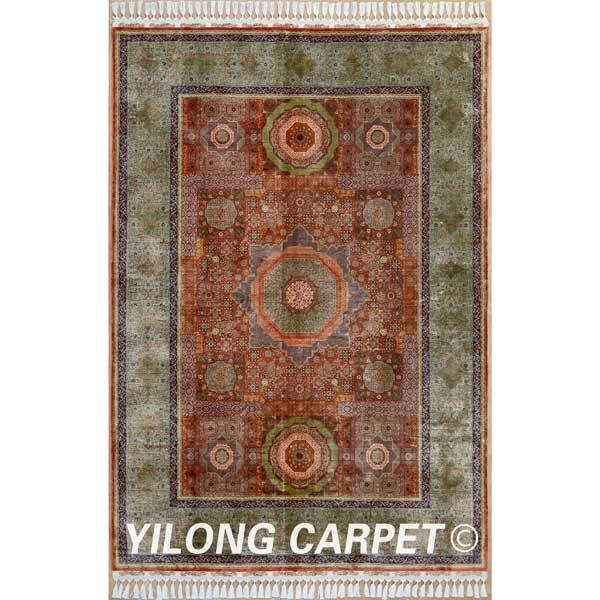 Copyright © 2012 Henan Yilong Carpet Co.,Ltd. All Rights Reserved.